Baldwin Park’s Bastidas! have been a band for more than a decade, and if you’ve been to any kind of DIY punk-ish show since like 2008, you’ve probably seen them—and if you’ve seen them, you’ll be more excited than anyone for the release of their first-ever LP Galaxias. The whole record is seething with energy and reveling in a predilection for the unexpected, but single “Fracasó” is a stand-out: it’s tense and propulsive post-punk with a Joy Division-style sense of space and menace and a midsong climax-slash-breakdown where everything almost but not quite snaps in half. 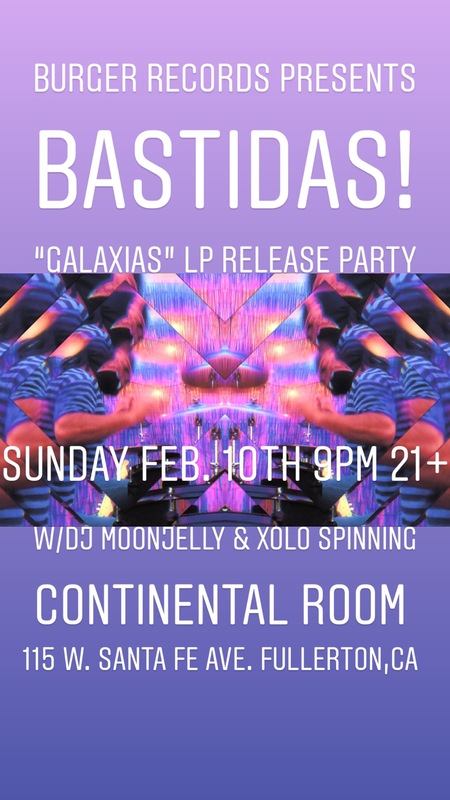 Bastidas!’ Galaxias is available on cassette soon from Burger—get it here!—and out digitally now, and they’ll be playing a record release show at the Continental Room in Fullerton with DJs Moonjelly and Xolo on Sun., Feb. 10—flyer below!